Hemodynamics or hæmodynamics is the dynamics of blood flow. The circulatory system is controlled by homeostatic mechanisms, much as hydraulic circuits are controlled by control systems. Hemodynamic response continuously monitors and adjusts to conditions in the body and its environment. 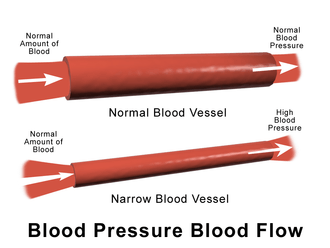 Thus hemodynamics explains the physical laws that govern the flow of blood in the blood vessels. The relationships can be challenging because blood vessels are complex, with many ways for blood to enter and exit under changing conditions. Immediately following the arterioles are the capillaries. Following the logic obvserved in the arterioles, we expect the blood pressure to be lower in the capillaries compared to the arterioles. Since pressure is a function of force per unit area, (P = F/A), the larger the surface area, the lesser the pressure when an external force acts on it. Though the radii of the capillaries are very small, the network of capillaries have the largest surface area in the vascular network. They are known to have the largest surface area (485 mm) in the human vascular network. The larger the total cross-sectional area, the lower the mean velocity as well as the pressure. 1 2 Costanzo, Linda S. (2003). Physiology. Board Review Series (3rd ed.). Philadelphia: Lippincott Williams and Wilkins. pp. 73–113. ISBN 0781739195. 1 2 Caro, Colin G. (1978). 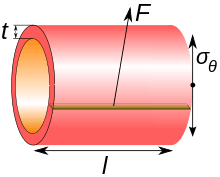 The Mechanics of The Circulation. Oxford [Oxfordshire]: Oxford University Press. ISBN 0-19-263323-6. ↑ "Normal Blood Pressure Range Adults". Health and Life. ↑ Klabunde, Richard (2005). Cardiovascular Physiology Concepts. Lippincott Williams & Wilkins. pp. 93–4. ISBN 978-0-7817-5030-1. 1 2 3 Fung, Yuan-cheng (1997). Biomechanics:Circulation. New York: Springer. p. 571. ISBN 0-387-94384-6. 1 2 Markham LW, Knecht SK, Daniels SR, Mays WA, Khoury PR, Knilans TK (November 2004). "Development of exercise-induced arm-leg blood pressure gradient and abnormal arterial compliance in patients with repaired coarctation of the aorta". Am. J. Cardiol. 94 (9): 1200–2. doi:10.1016/j.amjcard.2004.07.097. PMID 15518624. 1 2 3 Munson BR, Young DF, Okiishi TH, Huebsch WW (2009). Fundamentals of Fluid Mechanics (Sixth ed.). New Jersey: John Wiley &Sons, Inc. p. 725. ISBN 978-0-470-26284-9. ↑ Womersley JR (1955). "Method for the calculation of velocity, rate of flow and viscous drag in arteries when the pressure gradient is known". Journal of Physiology. 127 (3): 553–63. PMC 1365740 . PMID 14368548. ↑ Sircar, Sabyasach (2008). Principles of Medical Physiology. India: vistasta Publishing. ISBN 978-1-58890-572-7. ↑ Rosenson RS, Wolff D, Green D, Boss AH, Kensey KR (February 2004). "Aspirin. Aspirin does not alter native blood viscosity". J. Thromb. Haemost. 2 (2): 340–1. doi:10.1111/j.1538-79333.2004.0615f.x. PMID 14996003. ↑ Fung, Yuan-cheng; Zweifach, B.W. (1971). "Microcirculation: Mechanics of Blood Flow in Capillaries". Annual Review of Fluid Mechanics. 3: 189–210. Bibcode:1971AnRFM...3..189F. doi:10.1146/annurev.fl.03.010171.001201. ↑ Lough, Mary (2015-04-15). Hemodynamic Monitoring: Evolving technologies and clinical practice (1 ed.). St. Louis, Missouri: Elsevier Mosby. p. 25. ISBN 978-0-323-08512-0. ↑ "haemodynamic". Oxford Dictionaries. Oxford University Press. Retrieved 2016-01-20.